I don't think there is a food further from my upbringing in the mid-west than Polenta, so of course it has always intrigued me. I've also never seen it on a restaurant menu or had it at anyone else's house, which is unusual given the way unique foods have increasingly moved out into the mainstream in the last few years. At one high-end event the caterer was offering small ceramic spoons that included Polenta as the base and they were wonderful, but that's the sum of my experience. I take that back. I once tried a recipe that used the store bought Polenta. This pre-cooked version is usually found in the pasta aisle and has the shape of a tube of sausage. You cut slices, lay them flat - sometimes grilling first - and top with other ingredients. I only have one word for this product - uninteresting. That said, there are TONS of recipes on the internet using it. Perhaps the tube I purchased was on the shelf too long or a sub par brand, but I will make my own from scratch in the future just to be safe. After this experience I set aside Polenta for awhile in frustration, but few weeks ago a recipe popped up that looked intriguing. While it received mixed results, it was a hit in my book. Of the 5 people who tried it, 3 of us enjoyed it, 1 wanted more flavour and 1 didn't like it all. Obviously it is something you enjoy or you don't which is the norm with a lot of unusual foods. I honestly prefer making it fresh - better taste. 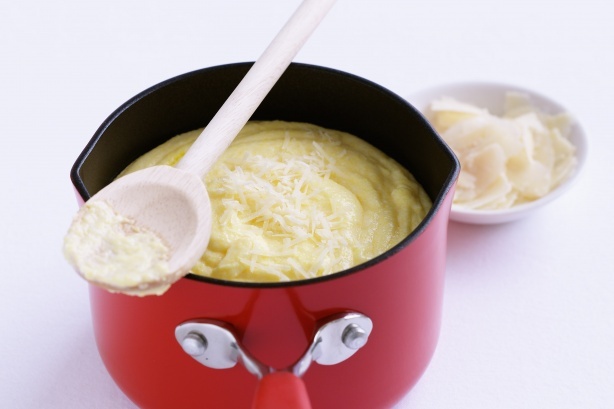 Let's start with the basics - what is polenta? 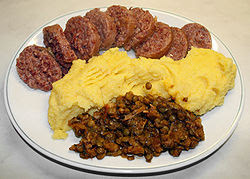 They have a great overview on the Gourmet Foods page at About.com. I like to describe it as Cream of Wheat only made from cornmeal. It really is just the grain stirred into boiling water and simmered until it is a soft, thick mush. 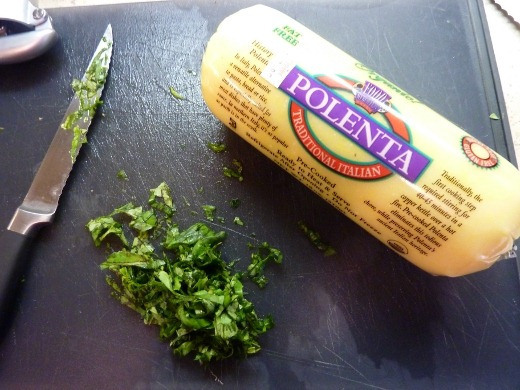 This is very bland, so most recipes will add herbs, cheese, butter, etc. to round out the flavour. It is normally a base to top with flavourful sauces or stews or used as a side dish. It can also replace the biscuits on top of pot pies. Another interesting use is to spread the soft Polenta out after cooking and let cool. This is then cut into shapes which are grilled or used as a base and topped with other ingredients. One recipe link below uses this technique to top a casserole. 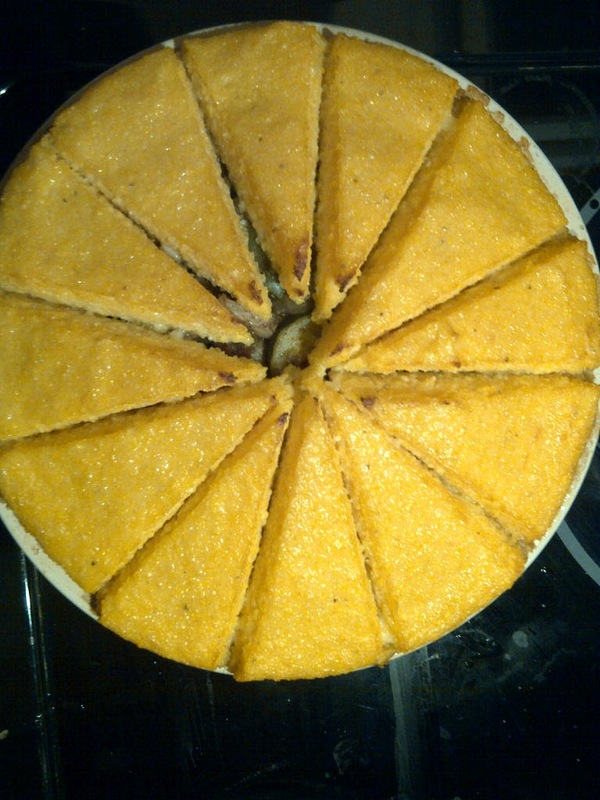 Polenta Torte is intriguing as the layers are soft Polenta instead of firm. The first bite I was unsure if I liked the texture, but by the 3rd I was in love with the way it warmed me on a cold night. The recipe has been tweaked of course. 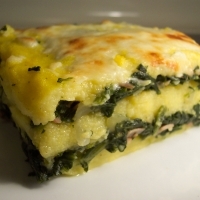 They used 20 oz frozen spinach thawed and squeezed dry, but I preferred to work with fresh. I found a 5 oz package of baby mixed greens and then used baby spinach for the other 15 oz. This is a big pile that cooks quickly down to a small quantity. I also added diced mushrooms - one member isn't a big fan so prefers the smaller pieces. As stated below, if I make this again, I will be adding some cheese and possibly other ingredients to the Polenta to give it a bit of interest on it's own. It's a great counterpart to the filling, but a bit bland if you get a spoonful by itself. Last but not least, the smoked ham needs to be flavourful. It's is one of the important notes in this recipe. If you want to create a Vegetarian version by removing the ham, you will need to replace it with an ingredient of equal power in the flavour department. 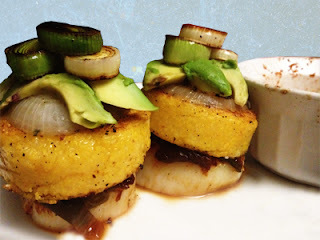 I have offered links to 6 other recipes, chosen because they are great examples of other ways to work with Polenta. Be brave and enjoy! Preheat oven to 400F and line an 8-inch round springform pan with aluminum foil. Spray bottom and sides of pan with non-stick cooking spray such as Pam. Heat oil in a large skillet over medium heat. Add onion, garlic and mushrooms and saute until onion is soft. Add spinach (or a combo of greens). Note, this looks like a HUGE pile of green but it wilts down pretty quickly to a small amount of cooked. You may have to add in batches, but make sure to constantly stir so those added first do not overcook. As soon as the greens are wilted, stir in ham, pepper and salt to taste. Saute until heated through - about 5 minutes on low. The original recipe says until no liquid remains, but I found that would overcook the greens so I chose to drain in a colander. I took most of the excess moisture out, but left it a bit damp. Squeezing it completely dry would have removed a lot of flavour. It might be better with the frozen spinach though. Bring 4 cups water to a light boil in a large saucepan. Stir together remaining 1 cup water, the cornmeal, and salt in a bowl. Gradually add cornmeal mixture into the boiling water constantly stirring with whisk to keep it smooth. Reduce heat to medium-low and simmer, stirring CONSTANTLY, for about 5-8 more minutes. Spread 1/3 of polenta (cornmeal mixture) in prepared springform pan. Cover with half the greens mixture, half the Parmesan and 1/3 of Mozzarella. Repeat layering one more time. 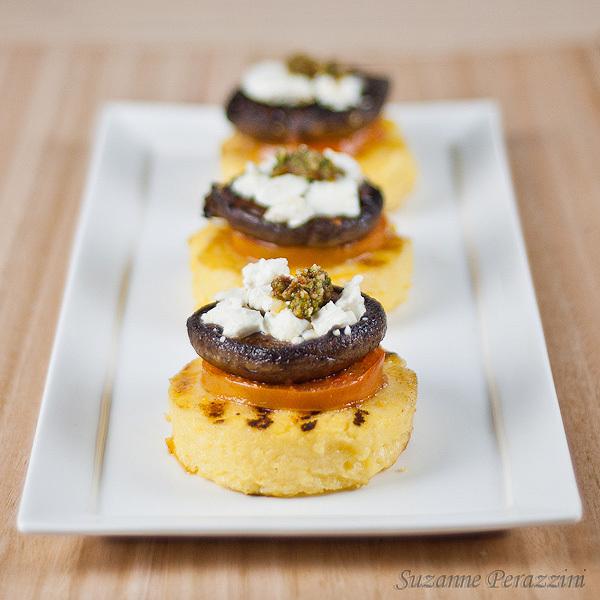 Spread with remaining polenta and sprinkle with remaining Mozzarella. Bake in preheated 400F oven for 30 minutes. The top should get golden brown. Let stand for at least 10 minutes before unmolding. Remove sides of springform pan and gently slice. Note - one option I can imagine for those who do not like the texture of the soft polenta is to spread the corn mixture after cooking into 3 - 8 inch circles and let cool. These can then be used as a slightly firmer layer in the torte. A couple of interesting recipes I am hoping to try soon. A link to another is above in the photo caption. vegetarian and gluten free which is a real bonus during the holiday season. 2. 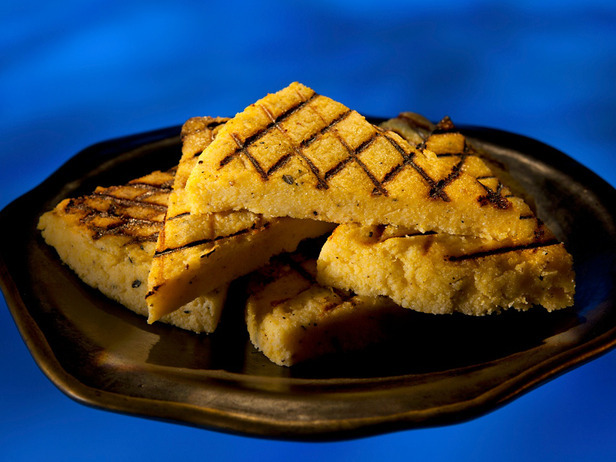 Here is Guy Fiero's version of Grilled Polenta found on the Food Network Website. 3. I'm not a big fan of eggplant, but this recipe may make me a believer. Polenta Torte with Balsamic Vegetables from Le Thrifty Gourmand uses the polenta in a slight different way that is interesting and could be easily applied to other recipes. 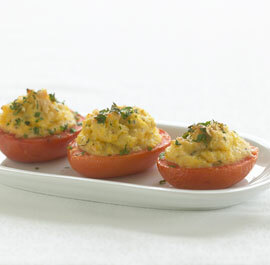 4.Creamy Polenta-Stuffed Heirloom Tomatoes was in a Fine Cooking recipe magazine I bought at the grocery store. Fortunately the recipe is also available online at their site. I think this could also work as a side dish. 5. 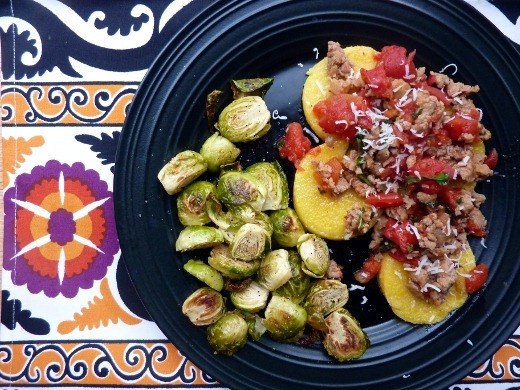 Last but not least is a recipe that looked interesting from Meg.Goes.Nom.Nom called Polenta Rounds with Sausage Ragout. It uses the dreaded store bought tube. I personally will be making my own Polenta rounds from scratch if I try this recipe, but I do love the idea.